Hopes of a U-turn on off-street parking charges were dashed as councillors agreed the rates that will come into come into force across Angus within weeks. Members of the communities committee have set a firm date of November 1 for the charges to apply. Signs are now being erected at car parks across Angus to detail the switch after more than two decades of free parking. Solar-powered cashless pay machines will also be installed and the new systems rigorously tested during October. The introduction of off-street parking charges had been approved previously but the variation that is required to set the rate had to be approved by councillors. The proposals were nodded through, despite a host of written objections from residents. From November, it will cost £1 an hour to park in off-street car parks, up to a maximum of £4 for four to nine hours. Short stay car parks remain limited to two hours and a maximum of £2. Annual or six-monthly permits of £260 and £130 – equivalent to £1 a day, five days a week –will also be offered. The scheme is forecast to deliver a £700,000 full year return for the authority. 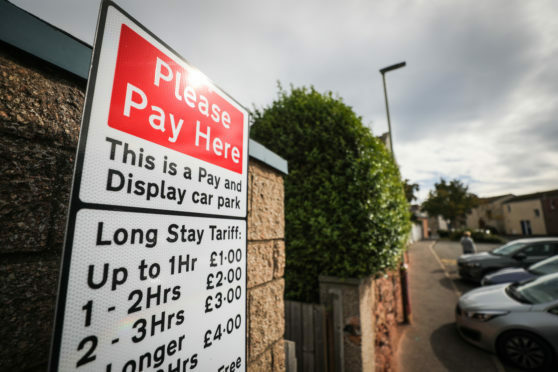 Communities convener, Montrose Independent councillor Mark Salmond, said: “Introducing parking charges for our off-street car parks will help to raise essential income to invest in the work of the roads department and will also help to protect other vital front line services. “We believe it will help to increase the turnover of public parking spaces, so they are used more frequently, and allow for easy access to shops and local businesses for as many people as possible. “Angus Council has provided off-street parking free of charge for the past 22 years,” he added. The charges will be introduced at 33 off-street public car parks, but they are not being applied in village car parks at Fowlis, Glamis or St Vigeans. Car parks at Rosemount Road and Elliot in Arbroath, as well as William Street, Ferryden and the north and south seafront facilities in Montrose, will also remain free. The controversial proposal to re-introduce charges led to widespread local opposition and claims the move could create “tumbleweed towns”. The committee unanimously approved the report without comment, having considered a number of letters of representation. One opponent wrote: “We must at all costs support our local community – too many businesses have already closed, much to the detriment of the high street.